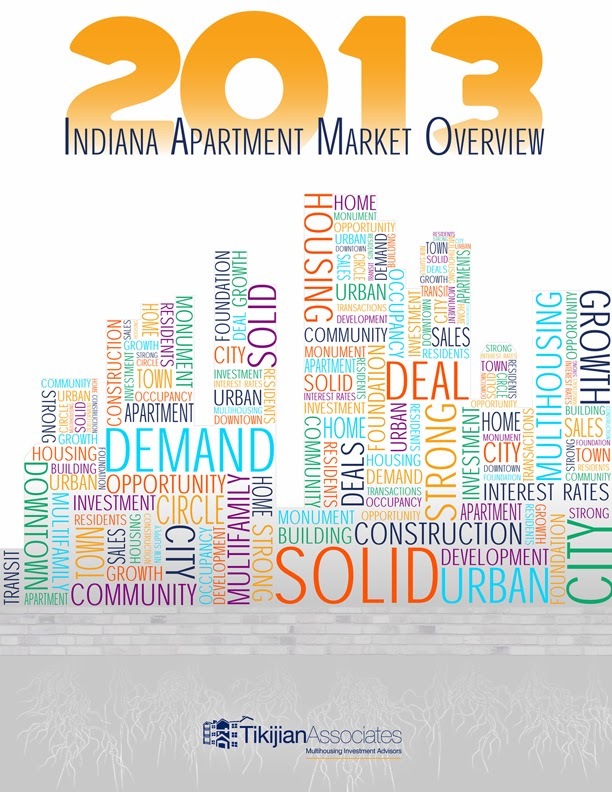 Our new Indiana Multifamily market data is now available. To download the market overview, visit our website here. A sluggish economy, uncertain future growth, and frustrating political gridlock in Washington have dominated the country’s news but have failed to dampen strong apartment performance. For multifamily owners, the last year has been a period of growth in both rents and occupancies – and sellers have benefitted from continuing strong demand for multifamily assets among real estate investors. Demand Trend - The Growing Impact of Millennials and the Trend toward Urbanization - A primary driver of apartment demand is the entry of the “Millennials” or “Echo Boomers” into the adult world. This generation (numbering 80 million people - the largest population segment in the country) is reaching adulthood at a time when home buying is not easy. A weak job market, firm credit standards, and large student debt burdens have closed the door to many who might seek home ownership. Equally important, the living preference of a large percentage of this generation differs dramatically from that of their parents, whose American Dream was based on home ownership in a suburban neighborhood. Instead, Millennials seek the freedom from maintenance and flexibility offered by renting, and many prefer a more urbanized living experience offering the convenience and social stimulation of living close to neighbors, work, shopping and many entertainment options. Urbanization is occurring not only in large cities but in growing or revitalized downtown areas of smaller communities (Carmel, Fishers and Westfield) and in attractive unique shopping and entertainment districts outside of the downtowns of larger cities (examples being Broad Ripple and Keystone at the Crossing in Indianapolis). The full impact of Millennials on the rental market will not be realized until an improving economy and job market provide the impetus for the formation of new households to the large number of Echo Boomers still living with parents. Booming Development - Because of strong rental fundamentals and attractive sale prices, it is no surprise that apartment construction is flourishing. Multifamily building permits issued nationally in July reflect an annual pace of over 300,000 units, the highest annual number since the recession and well above the 285,000 units completed in 2012 (per US Census). Bank financing for construction is readily available for qualified developers, although lenders are disciplined in new project underwriting and a meaningful amount of owner equity is required. Except for affordable housing developed using tax credits, most new development is Class “A” and much is occurring in areas benefitting from the trend to urbanization. The primary reasons for concentration of development at the high end are (i) the cost of new construction is too high to justify market rate properties that won’t command premium rents; and (ii) the Echo Boomer generation strongly prefers high-end unit finishes and upscale amenities. Increase in Interest Rates - Based on Ben Bernanke’s statement in May that the Fed would begin tapering its monetary stimulus this fall, interest rates on the 10 year treasury surged from 1.6% to almost 3.0% between May and August of 2013. After reaching a high of 2.98%, the rate now hovers in the 2.7% range. Most believe that the historically low rates enjoyed until May are gone for the foreseeable future. The increase in rates has and will, as would be anticipated, impact the apartment industry in varying ways. In regard to rental fundamentals, increased rates may be helpful in that they will make home mortgages more expensive, keeping more people in the rental pool. For owners of marginal properties facing loan maturities in the next few years, higher rates will make refinancing more difficult. We expect many such owners to be sellers as their loan maturities approach. In regard to current sellers and buyers, the increase in interest rates has impacted buyers more than sellers so far. Because of the existing strong competition among buyers for a limited number of assets, sellers have generally been able to achieve their price expectations and buyers have been willing to shoulder the impact by reducing yield requirements and/or infusing more equity in the transaction and taking advantage of periods of interest only financing. Other Developments in Financing - An additional major issue in financing is the future of Fannie Mae and Freddie Mac. Although Freddie has recently begun to emphasize the financing of apartments that constitute “working class housing” (a development which would benefit buyers and owners of Class B-/C properties), both Fannie and Freddie are under mandates to pare down multifamily loan originations by 10% from the previous year’s level. More importantly, there is discussion in Congress to end the agencies as we know them and replace them with limited government guaranties of loans originated by private lenders. FHA/HUD will remain a source for many owners, but has reduced attractiveness (i) for financing some older projects through the tightening of underwriting standards and replacement reserves and (ii) for new construction through the large increases in wages required pursuant to Davis-Bacon. To fill the void we see a growing role for CMBS financing for B-/C properties. Life companies will continue to be active in the financing of B and higher grade properties and may take on increased importance in financing new construction of such upscale apartments. As part of the urbanization trend, more development will occur in locations that require creative financing. Local governments will need to be an important player, financing infrastructure improvements through the creation of TIF districts and issuance of bonds to make such deals economically viable. Coming CMBS Maturities - Nationally, a huge number of outstanding multifamily loans are set to mature between 2013 and 2018, mostly CMBS loans which dominated apartment financing prior to the recession. In Indiana, there are 211 such loans, with 79 in the greater Indianapolis area. Almost two thirds of these loans originated in 2006 or 2007. Owners who faced loan maturities in the last two years have benefitted mightily from strong apartment fundamentals and the ability to either refinance at low interest rates or dispose of their assets in a favorable selling environment. The sheer number of maturing loans in the next five years, coupled with increased interest rates, will most likely result in an active market for private sales (to avoid default) and/or the return of the REO sale as a more sizeable percentage of future sales transactions, particularly if rates continue to climb. Major Property Tax Win for Indiana Apartment Owners – Apartment owners welcomed an important change in Indiana property tax law which will result in significant tax savings on most properties. The change relates to the tax rate caps passed in 2008 (and later made part of the state constitution) to prevent huge tax increases property owners received as the state transitioned from an assessment system based on replacement cost to one based on market value. The rate caps were designated as 1% for single family homesteads, 2% for residential rentals (apartments), and 3% for all other real estate. Soon after implementation of the rate caps, many assessors began separating apartment properties into two categories, with value of actual apartment units and the ground under such units classified for assessment purposes as residential property subject to the 2% rate cap, but common areas assessed as non-residential property subject to the higher 3% cap. After several years of lobbying led by the Indiana Apartment Association, the law was amended in 2013 to clearly provide that common areas of apartments are also residential in nature and subject to the lower 2% rate. The law is effective for taxes payable in 2014. Looking Forward - In the coming twelve months we foresee: (i) risk of further interest rate increases, with the amount of such increases tempered by slow economic growth worldwide; (ii) significant multifamily construction activity due to strong demand, available capital, and good performance of new high-end product; (iii) increasing pressure on rents and occupancy as a result of the delivery of a substantial number of units; and (iv) a steady pipeline of properties offered for sale, with some sales spurred by approaching CMBS loan maturities.